What's The London Shuffle Club Like? 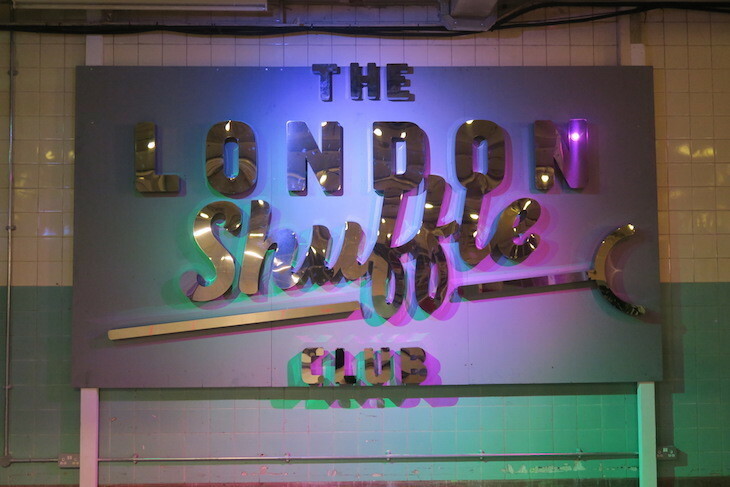 Laura Reynolds What's The London Shuffle Club Like? 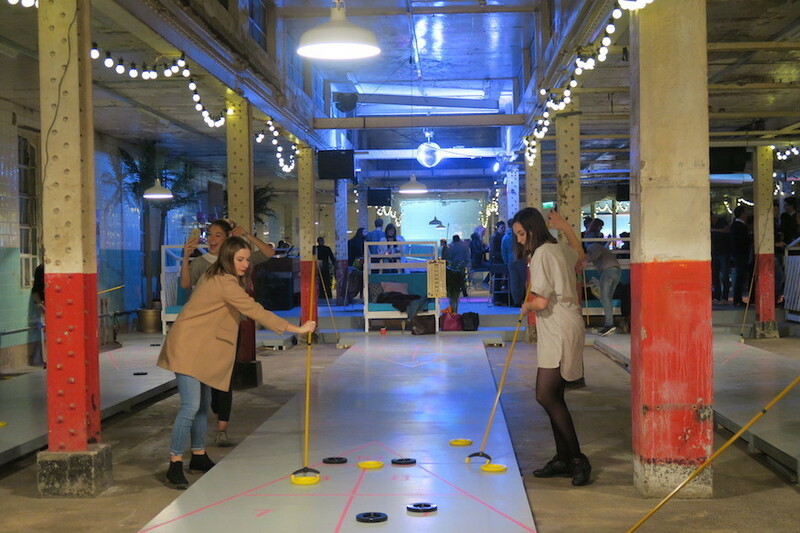 The London Shuffle Club — Europe's first dedicated shuffleboarding venue — is now open at the Old Truman Brewery. 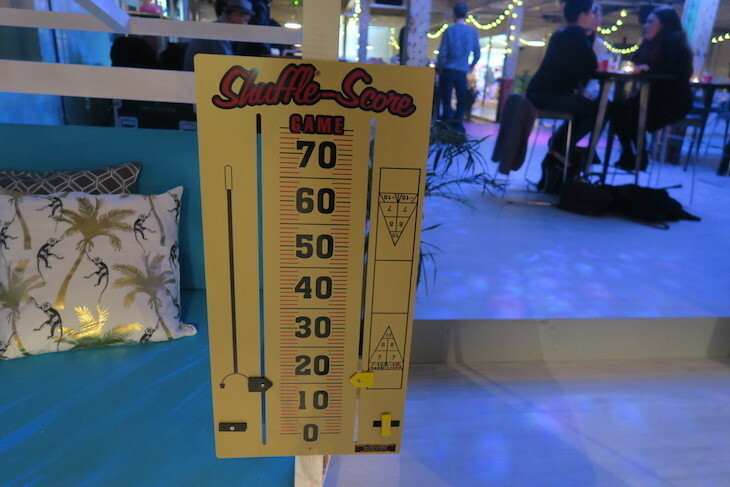 We went along to see what it's like... and what exactly shuffleboarding is. The setup is very Shoreditch, sitting in an old warehouse with an exposed concrete floor and tiled walls. 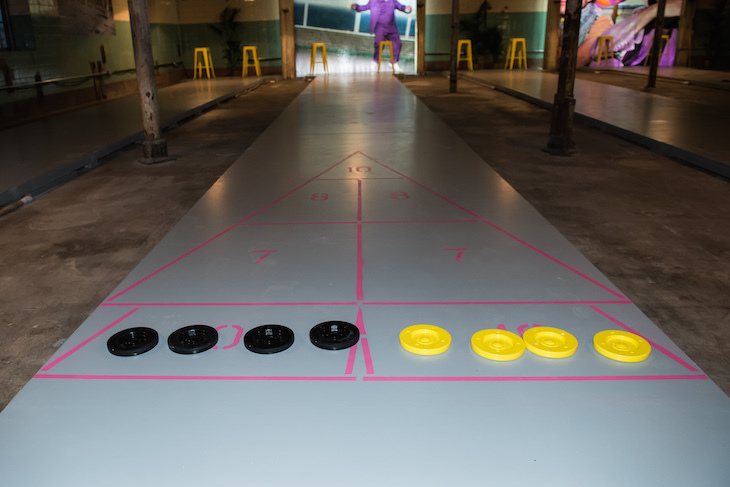 Not dissimilar to a 10-pin bowling alley, the noise of falling skittles is replaced with the occasional rattle of a biscuit (that's the puck-type disc you play with) tumbling off the court and onto the concrete. Occasionally a group stops to hunt down a stray biscuit, rendered missing by an overenthusiastic player. First impressions over, we're shown to our court, a long strip of polished wood which again is not unlike a 10-pin bowling lane. Fortunately, we're allowed to keep our own footwear, but at no point is stepping on the court (other than the playing areas at each end) allowed. We're each handed a long stick (a tang, apparently), and shown how to use it to skilfully push the biscuit towards the other end of the court in one movement, where floor markings denote different points for landing in different areas. In two teams, the aim is to rack up more points than the other team. Simples. Or at least it would be, were it not for the well-stocked bar. As our refreshment levels increase, the lines in which we hit the biscuit become less straight — all part of the fun. The London Shuffle Club is open at Old Truman Brewery near Brick Lane. Courts cost £40 an hour, recommended for four people. You need to book in advance.